Enjoy hiking, but thinking about taking longer treks into the backcountry? To date you may have relied upon your smartphone app for GPS, but now you are wondering if you need to buy a dedicated GPS device. Your app provides you with all the data you need, but the battery simply is not going to last as long as you need it to on your backpacking trips. Do you really need to go out and buy a standalone GPS? Not if you purchase a solar charger instead. A solar charger can recharge your smartphone on the go and off the grid. Thinking of buying a solar charger but aren’t sure what you need? Check out the table below to view features and pricing for top models. Still need more information? Read on to learn all about solar chargers. What is a Solar Charger? 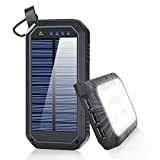 A solar charger is a portable solar panel or set of solar panels you can bring with you when you are hiking, cycling, camping, or doing other activities off the grid. It allows you to recharge your other portable devices such as your smartphone or tablet. How Does a Solar Charger Work? A solar charger harnesses the power of the sun and converts it into energy which your electronic devices can use. Do you get enough sunlight where you will use the charger? A solar charger only makes sense if you live in an area with sufficient sunlight to really get the most out of the system. If you live in an area which is perpetually dark and cloudy, it will take longer for the charger to soak up power for you to use. What type of panel do you need? There are several types of panels: CIGS are flexible, thin, lightweight, and portable, but they are most easily damaged. Monocrystalline panels are rigid and cumbersome, but durable and more functional in cloudy conditions. Polycrystalline panels are more affordable than monocrystalline panels, but they are also less efficient. Would you do better with power bank? A power bank (or external battery) may actually make more sense than a solar charger if you will be without grid access for only a few days (or less). If you will be away from the grid for four days or more though, a solar panel is usually the smarter choice. A charger with a lower wattage will save you money, but you will pay for it with longer charging times. If you only buy a panel with four to six watts, you can expect it to take three to six hours to charge up your devices. Panels with higher wattages may only take up to two hours. When looking at the output power, make sure you figure out how it is being reported. If you have multiple ports, is the output measured for both (or all) ports combined, or is it the amperage per port? If it is the latter, you need to add them together to figure out the total amperage for the entire unit. Several connection options may be available for solar chargers, but most will provide you with several USB ports, often including one high amperage port for particularly thirsty devices. For some devices, you may need an adapter. Many older cameras for example cannot hook up using a USB connection. Some solar chargers are large and bulky while others are incredibly compact. Many include features which allow you to latch them onto a backpack or a bike. These ease-of-use features are very important while you are out doing your activities; nobody wants to manually lug around a heavy, awkward charger while juggling other gear. The best solar chargers include integrated onboard batteries. These batteries are fully compatible with the charger, maximizing the efficiency of the device. The sun charges the panels, which in turn charge the battery, and then you can plug your devices in at any time to charge them up, even at night after the sun has gone down. Some chargers come with a range of accessories—these may include extension cables, adapters, charging indicators, carabiners, and other items. Make sure you know what accessories you need and which are included with your purchase. That way you know what you will have to purchase separately and how much it will add to the cost. You now know all about solar chargers and should be ready to shop! Scroll back up to the top of the page to view our comparison chart again in more detail. 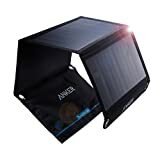 There you can check out prices and features for best-selling, highly-rated solar chargers on Amazon.com! Anker’s 21W solar charger was engineered for outdoorsmen. Its unfoldable design allows you to drape it over your backpack so that you can charge up your devices as you make your way through rough terrain. This charger is tougher than most solar chargers because it is made out of tough synthetic materials that won’t easily break down or fall apart. Simultaneous charging. Some solar chargers only produce a trickle of energy, but this one is efficient enough to power two phones at once. Weather resistance. Wind, rain and sunshine can’t wear down this gadget’s industrial strength components. You can fold it up. Unfold it to max out your charge, then fold it back up when you need to stow it away. Eco friendly. Standard chargers use up valuable resources when they charge, but this one draws upon free and clean solar power for energy. Wear it on your backpack. This charger is perfect for long trips and hikes. Zero cost charging. This charger’s revolutionary solar power charging system is surprisingly efficient for a device that runs on alternative energy. It might save your life. If disaster strikes and the power goes out for a long period of time, you can rely on this solar charger to keep important equipment powered up and ready to go. Though this charger can be used with most personal electronic devices, it’s unfortunately not compatible with iPod nanos, iPod Classics, iPod Shuffles, HP TouchPads and Asus tablets. This outstanding solar charger from Absone is perfect for survivalists. It’s got a built in compass plus a powerful, highly efficient LED lamp that will help you find your way in the dark if a disaster knocks out the power grid. It’s also water resistant, which means that you can rely on this device to make it through hurricanes, tsunamis and floods. Ultra sturdy design. This charger is resistant to shock, dust and water. Free energy. Because this charger runs on the sun, you don’t have to pay your electric company to refill its batteries. Built in compass. If you ever get lost, you can use the compass to find your way to safety. Compatible with standard power outlets. If the sun isn’t shining, you can plug it into an ordinary wall outlet and get a charge. Emergency LED light. The built in extra bright LED light could come in handy in a disaster recovery situation. Turns itself off. To conserve energy, this power pack switches itself off when you’re not using it. Reasonable price tag. Even though this device incorporates next generation alternative energy technology, it’s surprisingly inexpensive.